↑ Fricke, David. «Krist Novoselic». Rolling Stone. 2001 թվական, սեպտեմբերի 13. ↑ Di Perna, Alan. «Behind Unplugged». Guitar World. 1995 թվական, մարտ. Azerrad, Michael. Come as You Are։ The Story of Nirvana. - Doubleday, 1994. - ISBN 0-385-47199-8. Cross, Charles. Heavier Than Heaven։ A Biography of Kurt Cobain. - Hyperion, 2001. - ISBN 0-7868-8402-9. DeRogatis, Jim. Milk It!։ Collected Musings on the Alternative Music Explosion of the 90's. - Da Capo, 2003. - ISBN 0-306-81271-1. Gaar, Gillian G. In Utero. - Continuum, 2006. - ISBN 0-8264-1776-0. Morell, Brad. 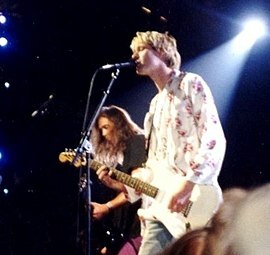 Nirvana & The Sound Of Seattle. - Omnibus Press, 1996. - ISBN 0-7119-5221-3. Rocco, John. The Nirvana Companion։ Two Decades of Commentary. - Schirmer, 1998. - ISBN 0-02-864930-3. Галин А. В. Жизнь и смерть Курта Кобейна. - Мерлон, 2001. - ISBN 5-900312-41-0. Климовицкий, Сергей. 100 страниц группы «Нирвана». - Нота-Р, 2004. - ISBN 5-85929-090-X.